As I drove to the airport to pick up my Mother-in-Law, I had no idea that I was starting a seminar in nutritional medicine. She was a warm and delightful woman but she struggled to walk with her 230lb on a 5’ 3” frame. She had high blood pressure, diabetes, and chronic fatigue, popping seven medications every day. Fast forward six months and she weighed 170 lbs, having lost 60 lbs and her blood pressure was 125/70 and her fasting blood sugar was 75. She had stopped all her medications under my supervision as her diabetes and high blood pressure were gone. She was walking two to three miles daily without pain and sun tanning by the pool. She had been medically transformed by a low fat macrobiotic diet of whole grains, vegetables, beans, sea vegetables and more, lovingly prepared by my wife, Vesna, a macrobiotic counselor of 16 years. Dr. T. Colin Campbell’s research on 880 million people conducted by Cornell University and Oxford University over 20 years and published as The China Study, concluded that “diets high in animal protein (including casein in cow’s milk) are strongly linked to diseases such as heart disease, cancer and type 2 diabetes.” Based on “the most comprehensive large study ever undertaken on the relationship between diet and disease”, Dr. Campbell recommended that people eat a whole food, plant based diet and avoid consuming beef, poultry and milk as a means to minimize and or reverse the development of chronic disease. 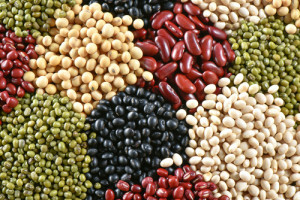 Dried beans: lentils, adzuki beans, garbanzo beans, mung beans, kidney beans, pinto beans, navy beans, black or yellow soy beans, black-eyed peas, lima beans, great northern beans. The following 12 reasons to choose macrobiotics is taken from Simon G. Brown’s book Modern-Day Macrobiotics:It is a broad, varied diet primarily consisting of grains, vegetables, fish, beans seeds, fruit and nuts. Many people claim that eating a macrobiotic diet has helped them to recover from illness. It is a flexible approach to eating that can be used over a few days or for life. Using macrobiotic principles you can choose and prepare foods to change the way you feel. You can eat anything as long as you know what the likely influence of that food is and are sure it will lead to good health. The high fiber used in macrobiotics keeps your digestive system healthy. Being low in saturated fats, a macrobiotic diet enhances your blood quality, improving your circulation and heart. Low on the glycemic index, macrobiotic foods encourage even blood sugar levels, making it easier to lose weight and enjoy emotional stability. The predominance of complex carbohydrates means that the meals proved plenty of sustainable energy, leading to greater stamina. 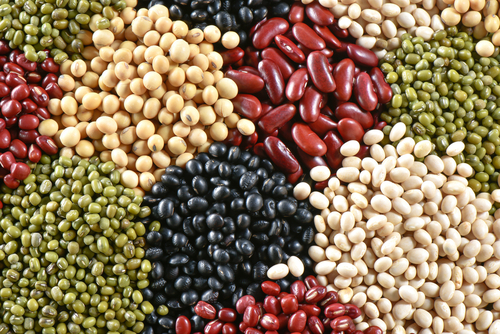 The general macrobiotic diet is high in proteins, iron, calcium and other minerals and vitamins. Macrobiotics is a complete approach to healthy eating that encompasses everything from selecting good ingredients, to cooking methods and eating. I have practiced medicine since 1970 and over the years I have tried every diet that hits the newsstands and bookstores, usually first on myself and then my patients. From the Atkins diet to the Zone diet, Mediterranean, Blood Type, Metabolic Type, on and on. Most are based on a little science and some are based on none. Most are nicely written in glossy books and promoted by well meaning and enthusiastic practitioners who in turn transfer that enthusiasm to their audiences. Therefore there is usually success, at least for a little while. But none of them stands on anything near the comprehensive epidemiologic research supporting The China Study, and none of them, except perhaps for the Paleolithic diet, is founded upon hundreds of years of ethnic and cultural wisdom as the macrobiotic diet. But culturally and emotionally based belief systems die slowly, and, you can use “science” to prove almost anything. As Dr. Campbell presents in one of his lectures titled, “The Worship of Protein in Modern Society”, we modern humans love meat. However, just like our ancestors, you can get plenty of protein from plant based foods such as whole grains, beans, vegetables, nuts and seeds. 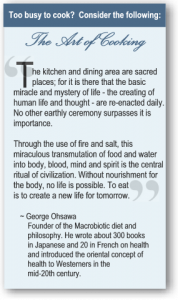 Basically, macrobiotics evolved from the experience of healthy cultures and astute healers over hundreds of years into a philosophy of living and eating that improves health in mind and body. Not only do most diseases gradually fade away as diabetes and high blood pressure did for my Mother-in-Law, but people experience greater mental clarity and emotional stability. Also, as people progress on the path of macrobiotics, they invariably notice that their body communicates to them and “tells” them what foods are best to eat. Vesna Cupara-Peters is the Macrobiotic Counselor at MindBody Medicine Center. She has 16 years of experience in macrobiotic counseling, including serving as personal assistant to the Macrobiotic and yoga teacher Vera Pilipovic from 1994 to 1997. In 2001 she was personal assistant to Mina Dobic, a renowned Macrobiotic Counselor who healed herself from cancer, and wrote a book, My Beautiful Life. And, in 2010 she completed a yearlong training program with David Briscoe, another international macrobiotic counselor who healed himself from schizophrenia, chronicling his experience in a book, titled A Personal Peace, Macrobiotic Reflection on Mental and Emotional Recovery. Whether your goal is simply to feel better, prevent disease, eliminate diabetes or help in treating cancer, Vesna can assist you on this powerful healing path.